Before 1849 there was no standard chess set. Instead there was a variety of designs in use that all differed from each other considerably. Different sets were prominent in different countries with chess players often preferring to use their native pieces in a game. This in itself was far from ideal and partly what got Howard Staunton so frustrated with the situation. The fact that he organised an international chess championship in London showed he was obviously keen to bring players from around the world together. Some standardisation was certainly needed. Chess had obviously existed for hundreds of years before Staunton came along, so it’s impossible to chronicle every pre Staunton design of chess set. Listed below are some common and well known designs that dominated the market before 1849. 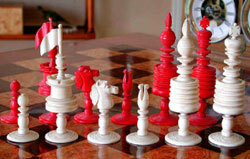 The St George design was named after a London chess club and manufactured in England by Jaques of London. It was universally popular until around 1850 when the Staunton design replaced it. The St George design was essentially a beautiful example of fine wood turning with some very nice carving. The English Barleycorn chess set was produced from around 1820 – 1850 although reproductions are still made today. It was essentially an English designed and made set but was very popular in America too. It was traditionally made from bone with red stained pieces opposing bleached white ones. The Northern upright chess set or Edinburgh chess set was popular between 1840 and 1860, only twenty years hence quite rare to see antique examples. 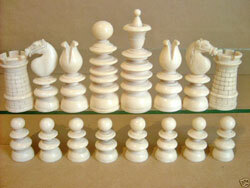 They are without doubt a very popular set of chessmen and are said to have inspired the Staunton design. They were turned and carved from either hard wood or bone. Not the most practical chess pieces to play with, mainly because they were rather slim and top heavy. 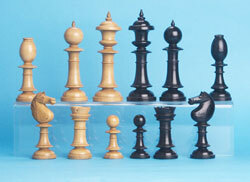 John Calvert produced and sold chess sets from his shop in fleet street from 1790 – 1840. He is said to have designed the St George set which was later produced of Jaques of London. His chessmen were beautifully turned and had wide bases which made them practical.